On the Canadian side of the border near the edge of the Canadian Horseshoe Falls is an area called Table Rock. It got its name because many years ago there was a piece of rock that resembled a Table Top that extended out over the falls. As the falls receded south, the slab of rock became longer as erosion worked its way below the rock. 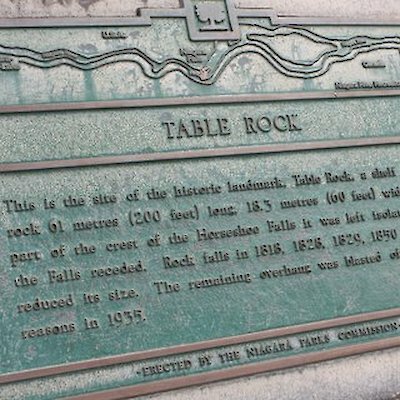 If you walk along the pathway north from the Canadian Horseshoe Falls you’ll see a plaque that indicates where the original Table Rock was once located and what happened to the piece of rock. 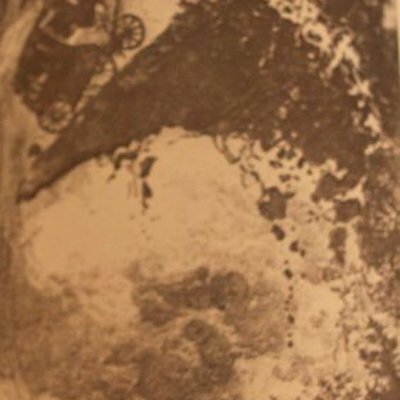 I’ve attached a photo of the plaque wording and the plaque itself with the falls in the background and an old weathered photograph of a sketch of a carriage in July of 1818 being carried to the gorge below during a rock fall. When you are in the area of the falls you’ll find numerous plaques outlining the history of the area. Take the time to read them. It will increase your knowledge of Niagara and make your visit even more interesting.